In this thesis, we explored and developed statistical methods for dealing with high dimensional and complex data. Specifically, we focused on modeling longitudinal VF data from glaucoma patients. We compared different regression models which have been previously investigated in the literature. 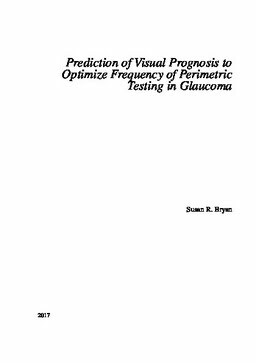 We evaluated these models with respect to both the fitting and prediction ability for progression in glaucomatous VFs. The models included classical approaches, as well as robust methods and models which take into account censoring. We extended this work to account for the complex structure of the data while dealing with censoring and the high measurement variability using advanced Bayesian hierarchical models. Nowadays it is often of interest to fit hierarchical models to data that are big both in terms of volume and complexity. However, it is also recognized that MCMC sampling can become computationally prohibitive when applying a complex models. To overcome these issues, we applied a recently proposed two-stage approach which allowed us to speed up computational time considerably while still benefiting from the full Bayesian approach. Furthermore, we extended this approach to allow for the calculation of model selection and model evaluation criteria. Other approaches such as integrated nested Laplace approximation (INLA) and hierarchical likelihood (H-likelihood) are also attractive alternative options. We investigated and compared these approaches to the classical one-stage and two-stage approaches. For the clinical application, we proposed to model factors which affect all locations belonging to the same VF as global visit effects (GVEs). We evaluated the GVE by determining the improvement of the model fit due to incorporating the GVE in the model and the effect of including the GVE on estimating the rate of progression. Furthermore, we determined the improvement of point-wise predictions for future measurements accounting for the GVE. Finally, we investigated the magnitude and importance of the GVE by comparing it to influential factors that have been discussed in the literature.